I’m pretty particular when it comes to helmets. They should fit well, ventilate my head well and not cause any painful pressure points. And generally I like them to be light, which is why I often opt for the top-of-the-line models from most manufacturers. Turns out I could be saving my money if only I’d found the Lazer O2 earlier on. Available at retail for around $109 (vs. the $230 or so that I paid for my Giro Ionos) I didn’t expect the O2 to be particularly comfortable based on sticker price, but the well-padded lid and rear dial-tightened Rollsys fit straps seemed sufficiently beefy and secure. I spent a week with the O2 replacing my Ionos on every ride, and found myself impressed with the Lazer, with a few caveats. 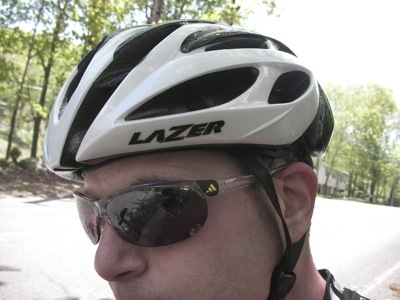 The Lazer is comfortable, in fact much more so than most helmets I’ve tried. There’s a pressure-point in the Giro Ionos I use as the benchmark, a section that impinges on the front of my temple that presses into my forehead when the rear-retention mechanism is tight enough for a secure fit. After a ride of sufficient length I end up with indentations on my skull. The Lazer, by contrast, had no outstanding pressure points, and felt comfortable through rides lasting from one to fifty miles. It’s also the same weight as my Ionos, and at 310 grams won’t feel bulky or uncomfortable though isn’t the lightest on the market. Lazer’s own Helium weighs a mere 220g, and the Giro Atmos (the previous top-end helmet from the company) weighs 275g. The vents on the O2 are plentiful, but not as wide as those found on more expensive helmets, which is to be expected. The O2 breathes well, though high-temperature climbs left me feeling the same desire to chuck the helmet overboard as with any other lid. There were only two issues with the O2, both minor, which kept it from being a perfect helmet. In the first issue, the helmet’s retention system, which ratchets down via a unique dialing system, tends to come very slightly loose over the course of a ride. Every 10 miles or so I’d find myself re-tightening the dial to ratchet it back to snug. The second is simply a matter of personal design preferences–the peak of the helmet’s front sticks every-so-slightly into the field of view, and catches my eye with its dark black silhouette. After some time I found my brain mapping this widows-peak out of my line of vision, but at the start of a line it felt like there was a crow flying directly overhead. For miles. To be fair, when I rode with a pair of sunglasses the upper edge of the glasses obscured the pointed top, rendering the problem moot. The point is designed to channel air into the main section of vents, but if I could trim off the tip of the helmet without ruining it, I’d have already done so. Those are both minor complaints though for a helmet that’s priced to fit the needs of the average consumer, especially considering the attractiveness of the overall package. Different helmets fit differently on many people and for some reason I often find helmets riding high on my head–I look a bit like a power-up in a Super Mario video game, but the Lazer O2 sits low on my head, making me look much less like a magic-mushroom and more like a svelte, powerful cyclist, at least when it comes to my headwear. At $109 it’s unusual to find a helmet that rivals the competitor’s top-end models that cost twice as much, but that’s exactly what the O2 provides. Good function, good fit and good value in a helmet that’s attractive (as far as helmets go, anyhow).